Valaciclovir, sometimes referred to as valacyclovir, is a treatment for genital herpes. It works by changing the DNA of the herpes simplex virus, so that it is unable to replicate. This means that the virus is unable to grow, helping the body’s immune system to attack the virus, inactivating it. This helps to reduce the severity of symptoms, and the length of an outbreak. Valaciclovir can also be taken over a long period of time to suppress outbreaks in those that experience recurrent episodes of genital herpes. Whilst valaciclovir is an effective medication that is used to ease symptoms, reduce the length of an outbreak and to suppress outbreaks, it is important to note that it cannot cure herpes. There is currently no cure for genital herpes, as the unpredictable behaviour of the virus has made it difficult for drug companies to create a cure. Valaciclovir can also help to ensure that you are less likely to transmit the infection onto someone else. It is also possible to pass genital herpes on through sexual contact, but you are more likely to do so when experiencing symptoms such as sores. Valaciclovir helps to keep the virus under control, minimising the chances of spreading the infection. How do you take valaciclovir? Valaciclovir should be swallowed with water, and the doses should be spread evenly throughout the day. You should complete the prescribed course unless told otherwise. If you forget to take a dose, take it when you remember, unless it is time for the next dose, in which case the missed tablet should be omitted. Those who are experiencing their first episode of genital herpes are required to take 500mg (1 tablet), twice daily for 5 days. Those that are experiencing an outbreak should take 500mg (1 tablet), twice daily for 3-5 days. Those that are using valaciclovir as a suppressive treatment to prevent regular outbreaks should take 500mg (1 tablet) daily ongoing. Treatment is usually taken for a duration of 6-12 months after which it is stopped temporarily before restarting again. This treatment should only be ordered if your doctor is aware, so that your regime can be monitored. Treatment is usually effective soon after you have started taking it, and symptoms usually begin to ease after the first day. Valaciclovir will also help to reduce the length of an outbreak by a few days. Those that are taking valaciclovir to suppress herpes should notice a decrease in the number of episodes. Valaciclovir is effective in treating genital herpes and has been used for many years, however, if you feel that it is not making a difference, please consult your doctor to discuss alternatives. Who should not use valaciclovir? 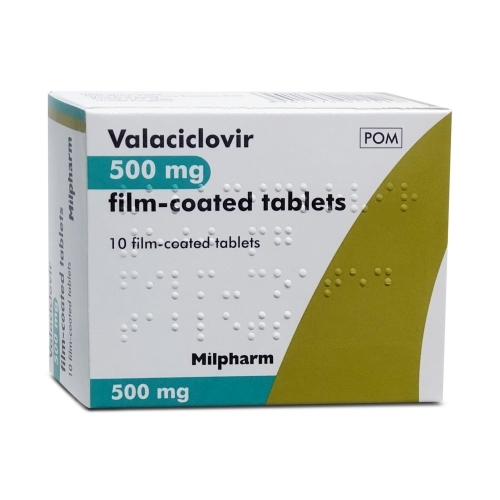 Valaciclovir is not suitable for those that have allergies to any of the ingredients, those above the age of 65, those with a weakened immune system, those with conditions that affect the nervous system and those with liver or kidney problems. We are unable to prescribe valaciclovir for those taking medication that affect the liver or kidney such as aminoglycosides, ciclosporin, cimetidine, foscarnet, iodine, methotrexate, organoplatinum compounds, pentamidine, probenecid and tacrolimus. Valaciclovir is can be used in pregnancy and breastfeeding, but we are unable to prescribe this online, as this practice is best done under the supervision of a doctor. If you have developed genital herpes for the first time whilst pregnant, it is important to see your doctor immediately, to avoid passing this onto your baby. If you have experienced episodes of genital herpes before pregnancy, it is unlikely that you will pass this onto your baby as the antibodies you have developed to deal with the virus will be temporarily passed onto your child during birth. You should still let your doctor know that you have herpes. Valaciclovir is a prodrug of aciclovir, which means that it converts to aciclovir once ingested. This means that it stays in the body for longer, so dosing is less frequent i.e. you only need to take valaciclovir twice daily for suppressing herpes, whereas aciclovir is taken three times a day. There is no significant difference between either herpes treatment, and both are effective. It is still possible to engage in sexual activity whilst taking valaciclovir, however, it is important to note that you are most contagious when experiencing an outbreak. When using valaciclovir as a suppression therapy, you are less contagious than when experiencing an outbreak, but it is still possible to pass the virus on to somebody else. There is no interaction between alcohol and valaciclovir, and you may drink whilst taking treatment. If you are experiencing an outbreak, it is advisable to avoid drinking in excess, as this can impair your immune system, which may slow down your recovery rate. You can order valaciclovir after you have completed a short medical questionnaire. Your medication will be sent out using a next day delivery service if ordered before 3pm Monday to Friday, or 10am on a Saturday.